Everett is a contemporary and versatile grotesque typeface that features an organic drawing and a particular digital flavor. Strong typographic details add a high tension while keeping a reading comfort, finding the right balance between a font that is graphic yet fluid. The typeface was initiated at ECAL, evolved since then and is currently still in progress. Posters from the first version are available through Draw Down Books. 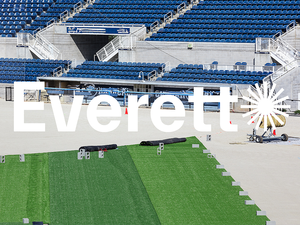 Everett is available on request. Further information is available in the specimen. See also Fonts in use for early applications. 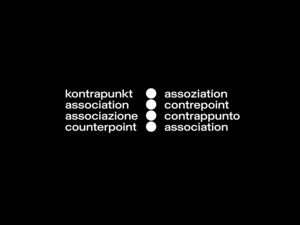 Counterpoint association is a Zurich based non-profit organisation that investigates the present through multiple art forms, create alternative narratives to foster critical thinking and mediate new territories for culture. The whole identity is constructed by bringing together the four most spoken languages in Switzerland, inspired by the aesthetics of the federal bureaucracy while adding a more contemporary, technical feeling. Modular identity system developed for Matière Vive, a Swiss based practice specialised in digital media and websites. The logotype is composed on a dots grid that allow to write their initials “MV” in various different ways, reflecting the variety of their work and the ability to adapt themselves in any kind of constraints within a project. The use of only lowercases refer to the web designer’s way of typing code. Custom version of my “Kunst” Didone typeface crafted to fit the identity of my “Everett” typeface commissioned by Herburg Weiland for the Richard Strauss Festival identity. The use of both fonts together as a musical notation system is the key element of their visual identity. Since this project, the “Kunst” typeface (working title) has been developed further and is still under construction. Diccionario Lukumí-Español offers a modern perspective on the Lukumí language, which is used mainly by the Yoruba community in Cuba during Santería ceremonies. Lukumí is an hybrid language, mixed of Spanish and African Yoruba. Commissioned by the designer Laura-Issé Tusevo, I developed a custom version of my Everett typeface for the publication. Based on the most recurrent letters in Lukumí, the typeface plays with double letters and thin punctuation, creating surprising rhythms throughout the various definitions of the dictionary. Contribution to the “Other Side” exhibition initiated by Le Cabinet SR:CH. My poster played with the bilingual and bicultural aspect of the association by highlighting a quote from Igino Marini in English and in Serbian, translated by a native-speaking friend. This contribution featured for the very first time my geometric yet playful typeface in development called “Supa” (working title). “Familial” describes best the atmosphere of the PUCH festival. This small open air festival of Bayern stays authentic and charming, proposing every year an inevitable summer rendez-vous in the countryside of Munich. Using only typography, the key visual creates a direct link to a known food icon, which is also popular and highly consumed in the area. Baumeister is a monthly architecture magazine published by Callwey in Munich and designed by Herburg Weiland since 2011. In collaboration with the studio, I developed the overall layout of this issue on the theme of “Sound forces” that features the new Elbphilharmonie of Hamburg pictured by photographer Andreas Mühe, among other essays. We created the visual identity for this new bar/restaurant in the heart of Munich. Working closely with Tom Ising, I developed a radical lettering based on a strict geometric construction which features a reversed contrast. The identity included designs of windows, menus, coasters and stickers. In collaboration with multidisciplinary studio Le Grand 8, I contributed on the establishment of the festival’s new visual identity. Reflecting the music festival’s atmosphere and audience, we refreshed their graphic identity with vibrant colors, playful typography and bespoke logotypes. I’ve also worked on the overall application of the identity, including designs of posters, newspaper, ads, wristbands, merchandising, etc. This photographic book published by Éditions Attinger traces back 30 years of political, associative and cultural life in the Val-de-Travers area in the canton of Neuchâtel (Switzerland) captured by photographer Daniel Schelling. We kept the design of the book simple and radical, in order to highlight the strength and sensitivity of the photographic work.